When many green stuff and clovers I can see, I feel oh spring is almost here. When Easter Sunday comes, I feel yes it is spring! Spring has a lots of colors. Color of sunshine, blue sky, new green leaves, yellow flowers, pink flowers, light brown sand, dark blue ocean, many lives come out from everywhere. I think that every one has own colors for each season…. 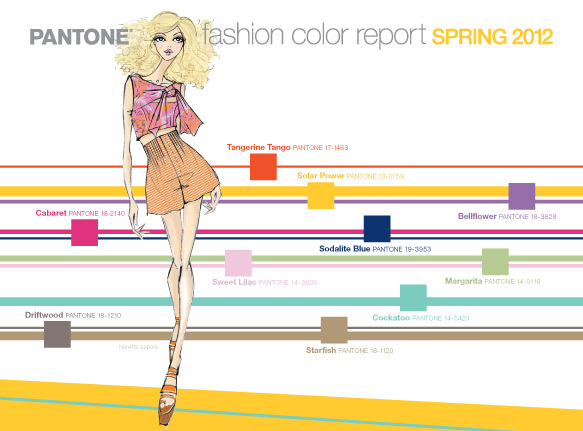 According to PANTONE spring colors for 2012, here is the colors for this spring…and symbolism of colors. Yellow: Joy, happiness, betrayal, optimism, idealism, imagination, hope, sunshine, summer, gold, philosophy, dishonesty, cowardice, jealousy, covetousness, deceit, illness, hazard and friendship. Purple: Royalty, nobility, spirituality, ceremony, mysterious, transformation, wisdom, enlightenment, cruelty, arrogance, mourning. Vivid pink: Love and romance, caring, tenderness, acceptance and calm. Indigo Blue: Peace, tranquility, cold, calm, stability, harmony, unity, trust, truth, confidence, conservatism, security, cleanliness, order, loyalty, sky, water, technology, depression, appetite suppressant. Yellow-Green: Green symbolizes Nature, environment, healthy, good luck, renewal, youth, spring, generosity, fertility, jealousy, inexperience, envy, misfortune, vigor. Blue-Green (Turquoise) : Turquoise symbolizes calm. Teal symbolizes sophistication. Aquamarine symbolizes water. Lighter turquoise has a feminine appeal. Light Purple (lilac) : Femininity, grace and elegance. Beige with Gray: Beige and ivory symbolize unification. Ivory symbolizes quiet and pleasantness. Beige symbolizes calm and simplicity. Gray symbolizes Security, reliability, intelligence, staid, modesty, dignity, maturity, solid, conservative, practical, old age, sadness, boring. Silver symbolizes calm. Earthy sand: Brown symbolizes Earth, stability, hearth, home, outdoors, reliability, comfort, endurance, simplicity, and comfort. What colors do you want to wear in this spring not only as your daily clothes, but also nails and eye shadows?? Please close your eyes…..and imagine…..
What colors come up from your mind? That is your colors for Spring 2012!